Our new maths block has been completed and has been named the Fermat Centre. The Fermat Centre is now open and is successfully being used for by the Maths Curriculum Area. Both staff and students are enjoying the experience of teaching and learning in the new building. The Fermat Centre was officially opened by the Rt Hon Jeremy Hunt MP, Secretary of State for Culture, Olympics, Media and Sport on Friday 25 March 2011. Weydon School is the first school to be built under the ‘ModCell Renewable Schools’ banner. The new 6 classroom block replaces a smaller 2 classroom block, so accommodating the existing student intake and the increase for the forthcoming 2010-2011 term. The design, by White Design Associates, was developed in close consultation with the school. Work was started on site, by contractors Deeks & Steere plc, during the summer of 2010, ensuring no impact on remaining school activities and exam timetables. Weydon School is a state run mixed comprehensive school, which was awarded with specialist science status in 2003. 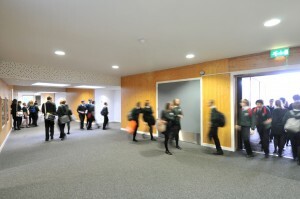 It caters for pupils aged between 11 and 16, and has an outstanding reputation as a ‘vibrant and innovative school committed to high standards and traditional values’. To deliver a revitalised school estate which can provide support and inspiration for educational needs and aspirations of the school staff, parents and pupils. 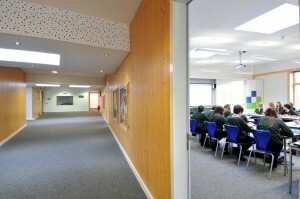 To utilise latest technologies in new building to provide teaching opportunities. The school defined an exciting building, which although is of a prefabricated construction, avoids the typical square box design that is often associated with school buildings. The opening of the Fermat Centre represents a triumph of partnership and close collaboration between Surrey Local Authority Capital Planning Team, Surrey elected members and the school building team. We have realised a wonderful building which is inspiring, cost effective and sustainable. White Design Associates, ModCell and Deeks & Steere plc, contractors, have provided a successful and professional design and building group which has enabled our students to work in a modern, light and airy environment complete with the latest technology. In particular, I would like to thank Richard Woods BSc MRICS of Willes Simpson Woods, our Project Manager, and Gillian Wrobel, School Business Manager, for their fastidious attention to detail in delivering this project. It is therefore an honour to have the Rt Hon Jeremy Hunt MP, Member of Parliament for South West Surrey and Secretary of State for Culture, Olympics, Media and Sport to open our building today. Jeremy’s passion for education, building of hope for young people’s futures and wanting the best for his local constituency is all mirrored in this building. This is especially true at a time when the need for the development of skilful mathematicians is vital for our future success. I am delighted, honoured and privileged to welcome everyone to this event. May the Fermat Centre be a great source of inspiration to all those who use it in the future. Pierre de Fermat is one of the top ten greatest mathematicians in history. Alongside Blaise Pascal, he established the foundations of probability theory, which is the mathematics of gambling, risk and change. Also, when Newton was asked where he got the idea of calculus from, he credited “Monsieur Fermat’s method of drawing tangents”. Already it is clear that Fermat has changed the world we live in, because everybody from insurance companies to stock markets use probability theory and everybody from architects to NASA use calculus. Fermat lived in the 17th century near Toulouse in southwest France, and his day job was as a judge dealing with some of the nastiest cases imaginable, including the condemnation of priests to be burned at the stake. 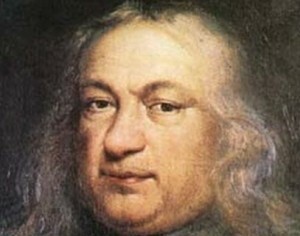 Judges were generally discouraged from socialising within the community in order to avoid a conflict of interests, so Fermat would spend his evenings hidden in his study, pursuing his mathematical interests. Fermat was a truly amateur academic and E.T. Bell called him the Prince of Amateurs. However, when Julian Coolidge wrote Mathematics of Great Amateurs, he excluded Fermat on the grounds that he was “so really great that he should count as a professional”. This was typical of Fermat. He was a mischievous mathematician, who was forever tormenting his rivals. René Descartes called Fermat “a braggart” and the English mathematician John Wallis called him “that damned Frenchman”. Fermat wrote several other notes, saying things like “I can prove such and such but I have to feed the cat”, or “I can solve a particular equation but I have to wash my hair”, and all of these notes were discovered after his death. Mathematicians across Europe studied Fermat’s observations and attempted to rediscover the proofs behind the theorems. Over the course of the next century, each theorem was proved, except for the one, which would become known as Fermat’s Last Theorem. In 1906 Paul Wolfskeh bequeathed 100,000 Marks to whoever succeeded in proving Fermat’s Last Theorem. It was not until 27 June 1997 that Andrew Wiles officially collected the prize (after two years of scrutiny to test his proof, as demanded by the rules of the Wolfskehl Prize). When it was originally established, the Wolfskehl prize was worth $2 million dollars, but hyperinflation followed by the devaluation of the Reichsmark had reduced its value to $50,000.